My daughter was so excited to come downstairs one morning last week and see a new doll sitting on the counter, waiting for her. I told her that as long as she was good, we would open it up and she could play with her later that day. (she had been rather mean the evening before, so it was a well-timed arrival that I could use this new toy to inspire good behavior). After a successful day of being on her best behavior, we finally opened up the doll. Being only 4 years old, my daughter was a lot more interested in the doll than the story behind the doll. As an adult though, I knew that this was more than just a doll. We had received the Hearts to Hearts Girls doll - Lilian of Belarus. Changing the World One Heart at a Time! That is the goal of the new Hearts For Hearts Girls doll line and fashion collection from Playmates Toys. 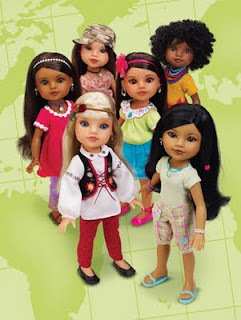 The collection features six dolls from around the world, each with an inspiring story to share. Each doll is 14" tall and comes dressed in culturally inspired clothing. Each doll includes a "girl-sized" Hearts for Hearts friendship bracelet. It also includes a story booklet that shares about the doll's life. Included with the purchase of doll is a special code that unlocks a free membership to the kid-safe Hearts for Hearts Girls website. I checked out the website and even with out the free membership, you can read Real Girl stories, which features stories about girls in countries that are making a difference in their community. You can also read and learn more about each doll and their country. You can also play the games in demo mode. By logging on with the free membership, your daughter can access the full games and a special "myHeart" page. There is also access to the doll's diary, where she continues to share about her life. 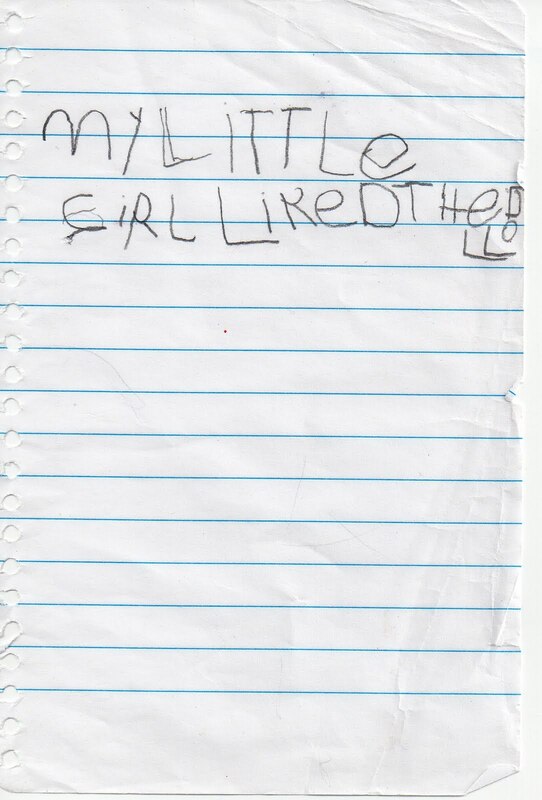 (She is good with letters, but not so good with proper use of upper/lower case or layout. 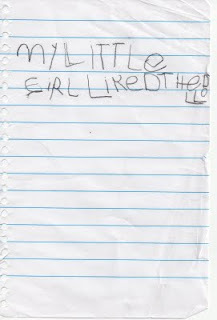 This says: My little girl liked the doll) When I asked her what she liked, her response was "everything about it!" I'd say that is a pretty good review! I think that my daughter really likes that she can comb and style her hair. Most of our dolls do not have hair, or certainly not enough to brush. She even came with her own pony tail holder and comb. I should clarify by saying, my daughter likes to comb her hair and have me braid it - an art that she hasn't mastered. She also likes that the doll can stand on her own - none of our other dolls can do that. She would like to have clothes to change her, but I have not seen that they have them available. Not only does my daughter like the doll, but I like that there is an educational piece with the back story on the doll, the inspiring stories on the website and the donation made for each doll purchased to children's programs in the home country. Want to get one? You can visit Playmates Toys to purchase Hearts for Hearts Girls . Enter the coupon code “DUXNT4S1” to receive $3.00 towards the purchase of a Hearts for Hearts Girl doll today! The dolls are also available through select retailers. Want to learn more? You can visit the Hearts for Hearts Girls Website and Like Hearts for Hearts Girls on Facebook. No compensation was received for this post. We received on Hearts for Hearts Girls doll from Playmates Toys for our review through MyBlogSpark. All opinions expressed are my own or that of my family.